I’m feeling a bit out of touch with the seasons here this year. Rather than dishing out recipes for winter squash and mustard greens and warm spiced desserts like I was this time last year, I keep coming up with these last few throw backs to warmer months. First it was kiwis and then sweet peppers, and now it’s rhubarb. Yes, rhubarb! Generally speaking, I’m sure most people would consider rhubarb to be a spring ephemeral, or at least not anything to be had past June. But I’ve recently discovered that’s really not true at all. In fact, it’s at its sweetest in autumn, just when it needs cutting back anyway. There are the big woody stems that should be tossed, but keep any of the slender and pliable ones to throw into such scrumptious treats as Apple Rhubarb Jam. Rhubarb has been a favorite of mine since I can remember, thanks to the long-lived perennial stand of it in my grandmother’s kitchen garden. It often fell upon me to walk to her house and twist off a few tender stems for one of my mom’s delicious spring-time desserts. I actually got the rhubarb for this recipe from her garden once again on a recent visit. Gardeners usually put in one or two year-old crowns of rhubarb when getting their patch started. I actually decided to put rhubarb in my own garden this year but wanted to try growing it from seed so I could observe the whole propagation process. So far, my plants are looking young but healthy, having snuggled into their bed for winter. I probably won’t be able to harvest anything from them yet next year but I look forward to plenty of rhubarb in 2010! Now, I’m sure you’re all thinking “PIE!” when you hear rhubarb. And maybe you’re also thinking “strawberries” at the same time. But let me see if I can broaden your perspective on rhubarb uses and companion flavors. Sweet little autumn apples are the perfect complement to rhubarb’s bright tangy flavor. And jam, when heading into winter, is a very necessary hibernation food store. I seem to be making a lot of little batches of jam this year, and I have to say this is definitely my favorite. 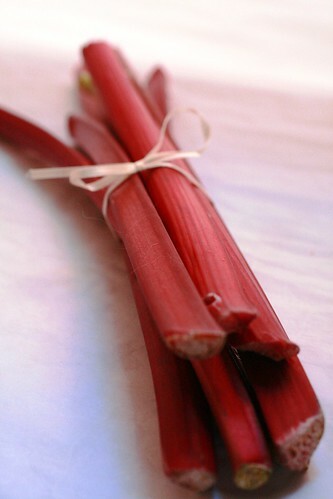 On a general note about rhubarb, be sure never to eat the leaves, only the stalks/stems, as the leaves are poisonous. Also, it is advised not to harvest rhubarb after it has been hit with a hard frost as this may increase the toxin levels in the stems as the leaves die back. *I used the vanilla scented sugar that I use to store my vanilla beans, which added a nice subtle flavor. 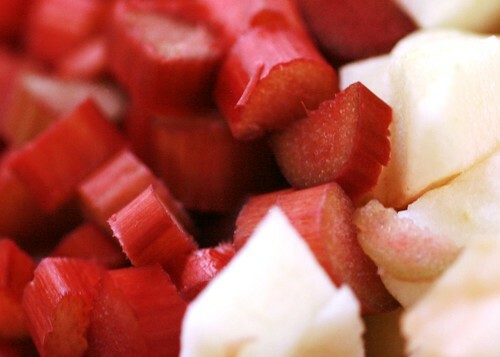 In a large saucepan mix together the rhubarb, apples, sugar, water and cinnamon. Bring to a boil, then cook over medium heat for 20 minutes or until the fruit is soft. Stir in the pectin and boil for 5 minutes. Ladle into sterile jars, wipe rims with a clean cloth or paper towel, and seal with new lids. Process in a bath of simmering water for at least 10 minutes, or as recommended by your local extension if you are at a high altitude. Store unopened jars in a cool dark place. Refrigerate jam after opening. Entry filed under: Preserves, Recipes, Sweet Treats. Tags: apple, cooking, food, jam, recipe, rhubarb. This looks delicious! Any idea where to get rhubarb this time of year? Balladofyoko – Unfortunately, this is one of those recipes that’s probably only useful in the autumn to those lucky folks that have a patch of their own rhubarb. However, bookmark it and make it in the spring for now. 🙂 Next year in Sept and Oct, ask around at a farmers market to see if anyone would be willing to bring in some stalks for you. rhubarb is so beautiful! great pictures. i’ve never eaten it any way besides stawberry rhubarb cobbler, but jam sounds great. And this is totally seasonal, especially since apples are at their peak right now. I totally wish I had a nice bush of rhubarb at my disposal… but I wonder if this would work with some that I’ve frozen? 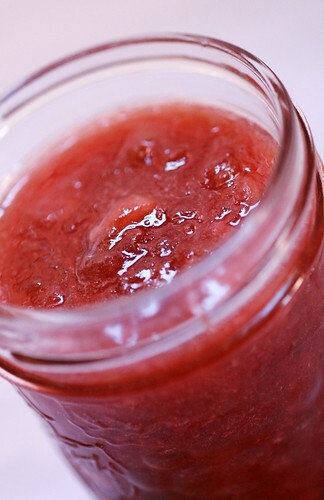 The color of the jam is beautiful and just reminded me that I don’t use rhubarb in the kitchen nearly as often as I should. The color is so vibrant. I agree, rhubarb is tricky this time of year. 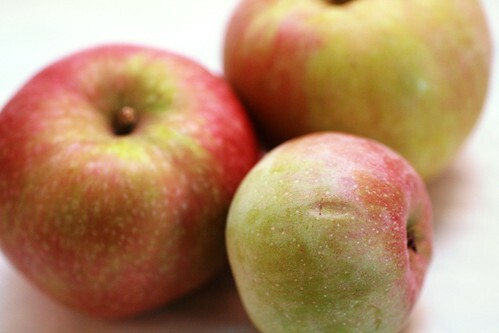 But, the recipe is perfect for early fall when apples are coming in and rhubarb is in its last days. I make apple rhubarb pie and we love it! great recipes! but haven’t figured out how to print them out without printing out all the other infor with them! any help on that? If you highlight the recipe text with your mouse (click and dray over it) and then click the right hand button of your mouse, it should pull up a menu of options. One of those options will be “Print”. Click on print and then there should be an option in the new print window that opens that says something like “selection” under “page range”. Choose “selection” or whatever seems closests to that option. Hit print and it should only print out the text you had highlighted. Hope this helps! I just made this up. I’ve got to say – it’s an excellent jam, but it is NOTHING like it says in this recipe or in the basis on AllRecipes. XD Mine is extremely apple-y, came out rather on the brown side (although my rhubarb patch is an old one and has very Very green stalks, so that’s unsurprising!) and I can hardly taste the rhubarb. I also wound up with a) apple chunks that would not break down and I wound up using a mill and b) only about half of the intended quantity! It’s delicious – just not even close to what we’d expected! So, not a loss, just… am I the only one who had theirs turn out differently??? If so… what happened?!? When do you add the nutmeg? Thanks! can I use home made apple sauce for this instead of the apples? I just made this and have to say that mine looks nothing like yours. It tastes wonderful. The only thing I would change would be starting to cook my apples first then adding the rhubarb about 10 minutes later. 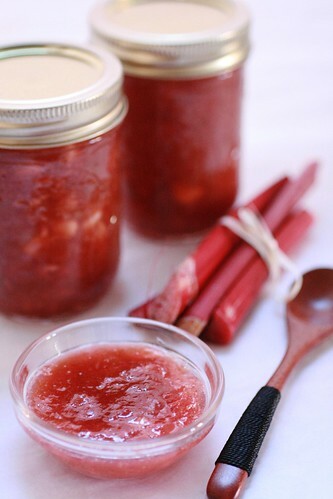 I will make this again since I have soooooo much rhubarb. Hot water bath time has been reduced to 5 minutes per Wisconsin Extension booklets.